Our bright and cheerful toddler rooms provide a fun and exciting environment for your toddler to expand his discovery of the world. With room for movement and exploration and activities designed to develop fine and gross motor skills, your toddler will flourish in our Learn-Through-Play environment. When it is naptime, our quiet and cozy sleeping area provides a peaceful setting for your toddler when it is time to rest. 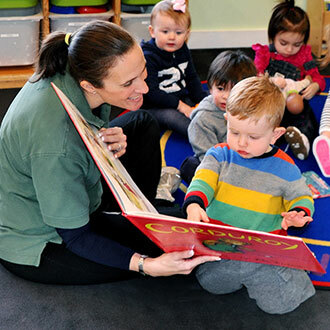 At The Day Care Center at Ivy League, the curriculum is reviewed by Ivy League School's Directors. This curriculum is appropriate to each developmental stage and is adapted to each child's emerging interests. Our low child-to-teacher ratio enables us to give special attention to each child. Our teachers are able to guide each child's individual abilities to enable him to reach each important milestone. Individual assessments help us determine the appropriate plan for each child. In Ivy League's learn through play environment, toddlers learn their numbers, letters, shapes, colors, celebrate the arrival of the seasons, increase their attention span, and learn to make friends. Through cooperative play, investigation and direct instruction, children extend their language ability, mathematical thinking and add to their knowledge base. Teachers pay particular attention to each child's cognitive, emotional and social development. They plan daily activities that encourage thinking and communication. Art and music are every day happenings as are relaxing and listening to a good story. Language Development: Toddler language development occurs at different rates for different children. Our teachers are active and patient language partners and keep the door open by promoting conversation. They take the time to listen, and do not speak for the child. Children are read to every day and use language play such as rhymes, finger play, poems and songs. Additionally, conversations and discussions about their daily explorations, entertaining stories and musical games and songs help build your child's vocabulary, stimulate imagination, and improve language skills. Fine Motor Skills: Practice is critical for toddlers to improve their fine and gross motor skills. 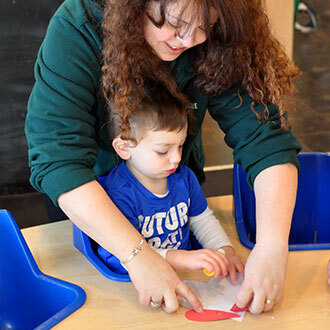 Writing with crayons or pencils, drawing, painting at an easel, puzzles, stringing beads, scooping sand, squeezing play dough, building with blocks and running small cars are just some of the ways in which toddlers are encouraged to use the many small muscles in their fingers, hands and wrists. Gross Motor Skills and Social Development: Toddlers need space to crawl, walk, and run to develop strong muscles, good balance, and coordination. They also benefit from safe spaces where they can explore their surroundings without hearing "No" or "Don't touch." At The Day Care Center at Ivy League, there is ample opportunity for large motor development as children explore our age appropriate playgrounds or participate in our gymnastics program. Discovery Abounds: Toddlers are exposed to many different toys and objects with a variety of shapes, textures, colors, sounds, and weights. We play music and interactive games while encouraging new challenges and activities to promote problem-solving and self-confidence.